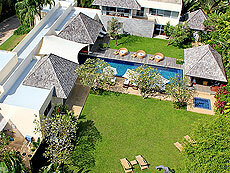 Villa Samakee is in the private location area where 5 minutes away from Laguna area in Phuket by car. This luxury rental villa is in quiet area but easy to access for shopping, eating, golf and other activities by car. In the villa there is a well-kept tropical garden,20 meter of infinity swimming pool and 5 Bedrooms. In the room have full of comfortable furnitures, amenities and equipments. The 5 Bedrooms could arrange by number of the guest stay.